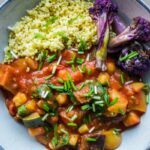 I love pottering in the kitchen and making complicated dishes but sometimes you just need simple, nourishing and delicious meals like this Eggplant and Chickpea Stew. Weeknights are often where I really struggle to know what to make, because usually I’ll come in from work tired and hungry and with nothing useful in the fridge. For me, getting organized with a couple of batch cooks per week has made a huge difference to how stressed I get around preparing food. I try to plan what I’m going to make ahead of time and shop for it when I do my regular grocery run. The best thing about batch cooks is that not only do you have a quick and easy dinner prepared usually in around 30 minutes, but you also have several portions leftover for lunches during the week. That’s another few meals you don’t have to make! 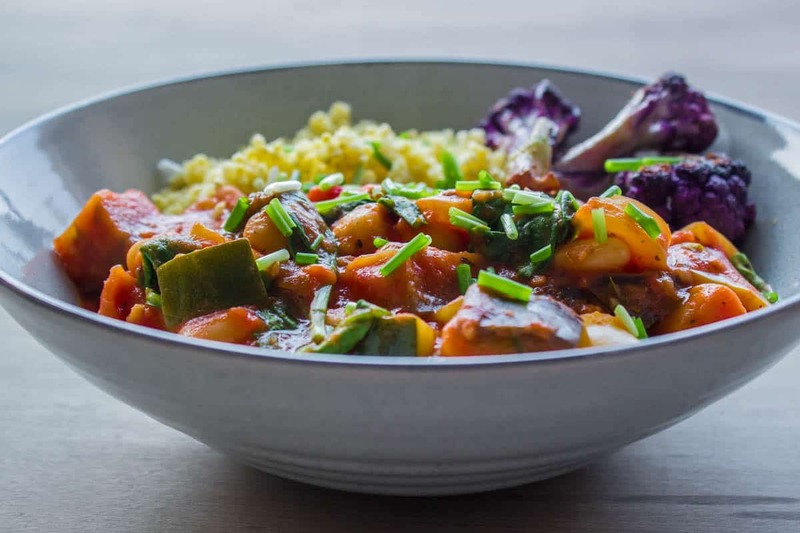 This Eggplant and Chickpea Stew requires minimal preparation beyond chopping veggies, opening tins and draining chickpeas so it’s an easy one to make after coming in from your day. I love that you can add all the ingredients to the pan, get the mixture to a simmer and walk away and leave it for 15-20 minutes while you do something else. Any leftovers are good for about 3 days if refrigerated in an airtight container. Chop the eggplant and zucchini into 1½cm cubes. Place them in a large soup or stew pot along with the crushed tomatoes, chickpeas, garlic, stock and dried herbs. On the stovetop bring the stew to a boil then reduce the heat to a simmer. 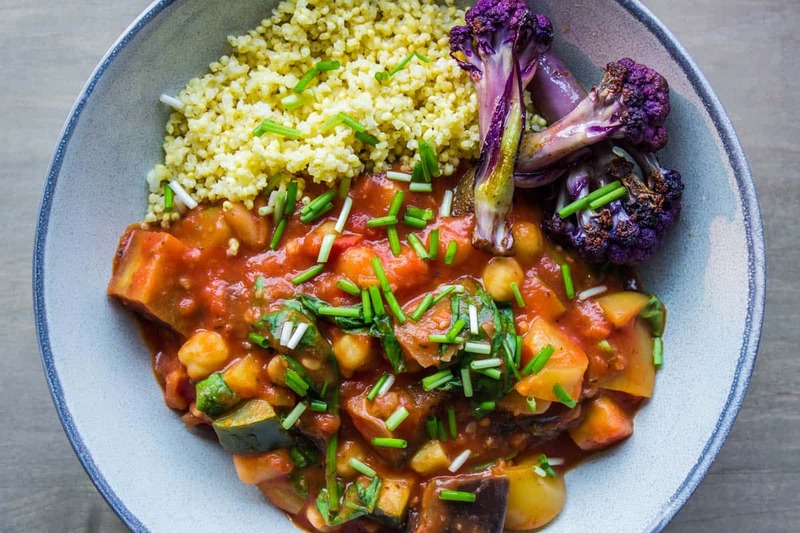 Cook for 15-20 minutes, stirring occasionally, until the eggplant and zucchini are tender. Stir in the coconut yoghurt and add the spinach. Cook for another 3-5 minutes, until the spinach has wilted. Serve with brown rice, millet or quinoa. 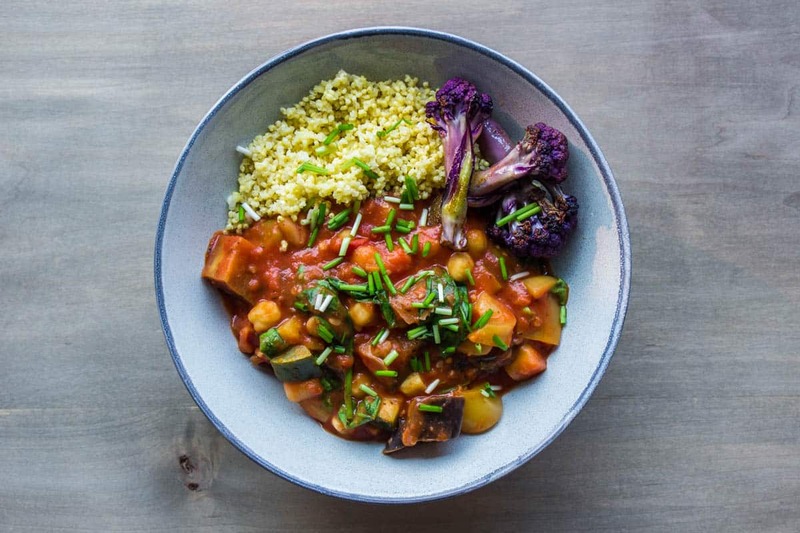 I also like to top the stew with chopped green onions, and if it’s in season add a small side serving of lightly sautéed purple (or regular) cauliflower as it tastes delicious and adds a pop of colour! For the cauliflower, lightly sauté florets for about 5-10 minutes in a small amount of coconut oil, sea salt and paprika to enhance the flavour.